This tutorial consists of 4 parts. Please scroll down to the section or sections that you feel most apply to what you are looking for. 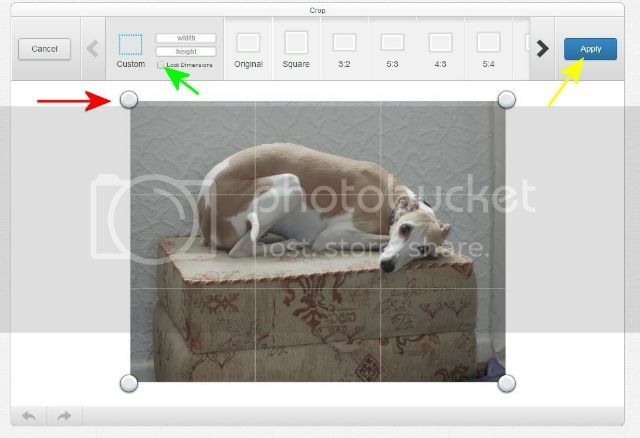 This is not a complete and thorough tutorial for everything you can do in Photobucket, but it should get you started in being able to use it as a basic storage and editing tool so you can link your photos to Whippet World or any other forums. However if there is anything else you would like help with, or if something isn't clear please feel free to ask and we will be happy to answer your questions as best we can. 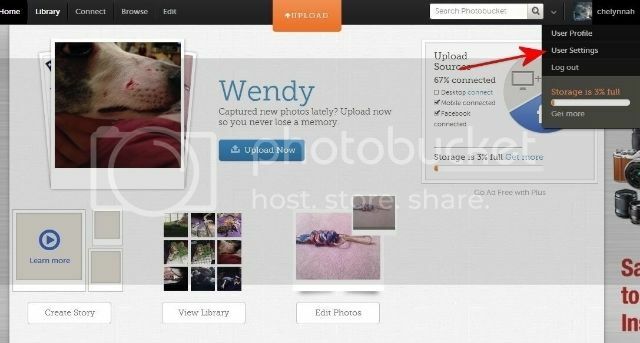 Go to http://www.photobucket.com and open an account or sign into your account. You can sign in or sign up in 3 places. 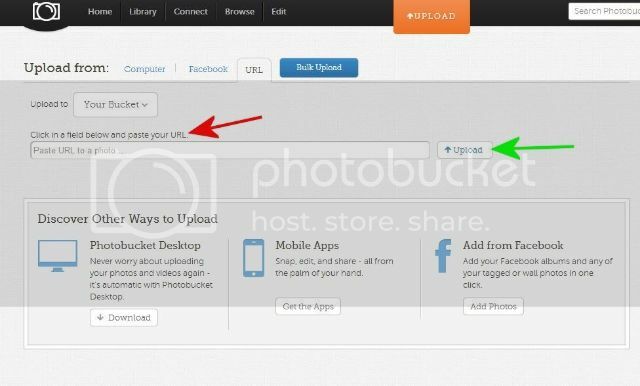 You can use either the links on the top right, the spaces in the middle (although it says sign up you can use this to log in as well) and you can also log in through Facebook by clicking that link and linking your Facebook account to your Photobucket account. This will take you to your Settings Area. You want to choose the tab called 'Albums', and set it to look like this. Check the same things I have checked, and leave unchecked the boxes that are empty. 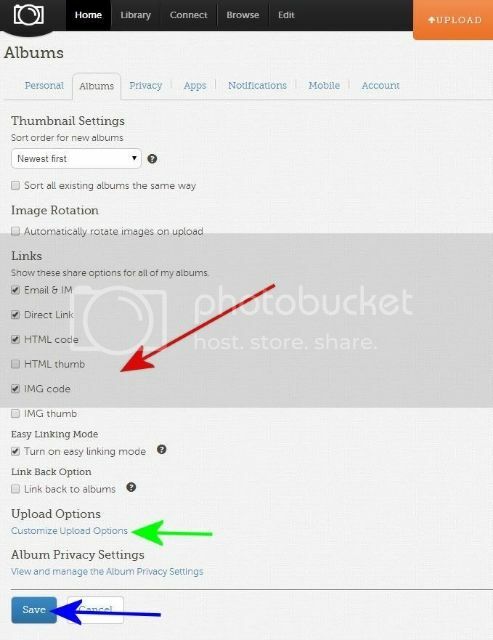 Especially important here is that you do NOT want to check 'linkback' (this will bring people directly to your photo IN your photobucket album if they click your picture) and 'HTML Thumb' (this one makes a small thumbnail people have to click to make bigger). After you have changed those settings click on SAVE. 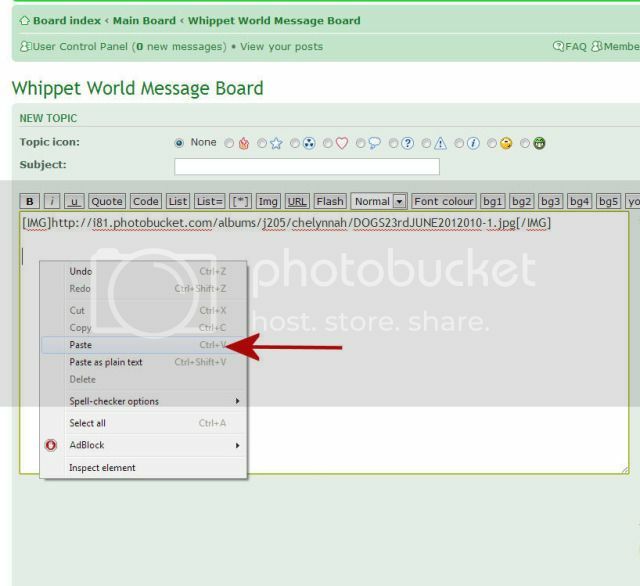 Then click on 'Customize Upload Options' (green arrow). 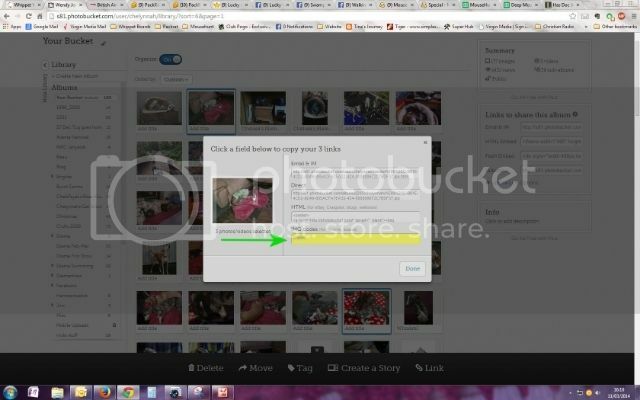 That will bring up what your photos will link to the board at (no matter how big your original photos are, they will only link out at the option you set here). You need to choose 640 x 480 and make sure to click on SAVE. Now click on Privacy. This is what I have mine set at. You can choose whichever options you want, but the important thing for now is that you want to make all albums public (if you are only using this for sharing your photos). If your albums aren't public, then no one but you can see them. 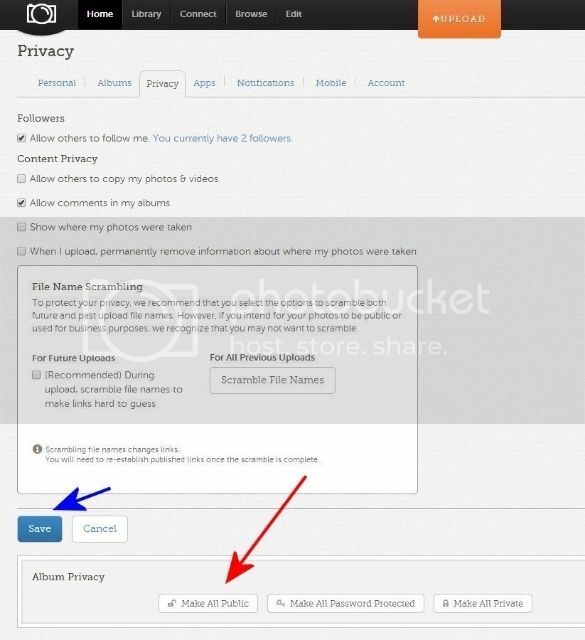 You can set each album's privacy individually, but for now go with public so that you will be able to share your photos. Make sure you click on SAVE after you make your changes. 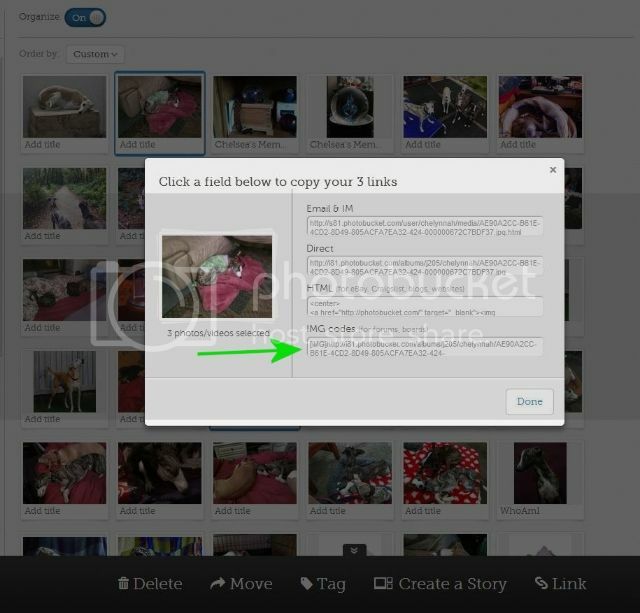 Now your Photobucket settings are set up and you won't have to change these any more. You only need to do this once. Now we move on to uploading photos. From your front page (see photo near top) you can choose Upload Photos from the blue box in the middle or the Orange Box at the top. From within any album you may have set up you can upload using the orange 'Upload' link or by clicking on 'More' near the top of the album and choosing 'upload to album'. The first photo below. Make sure you choose which album (if you have more than one) you would like the Photos to be uploaded to. Your 'default' album is called your Bucket. 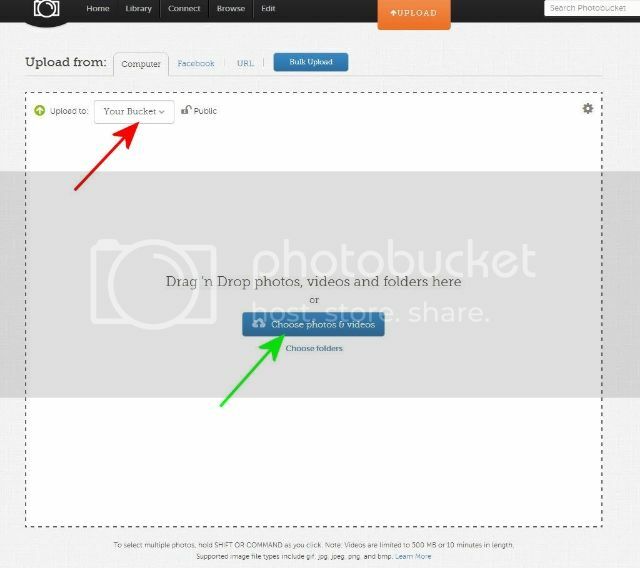 Click on 'Bucket' for a dropdown to show your other albums or create a new one. Then click on 'Choose Photos & Videos'. This will bring up your documents from your computer. 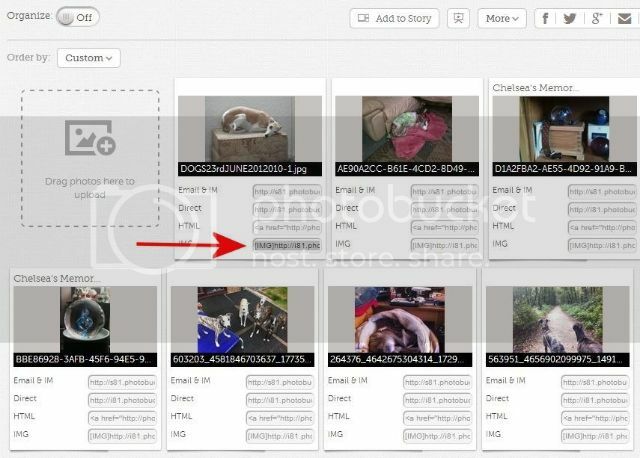 Find the file/folder you have the photo or photos you want and choose them, then click ok and they will be uploaded. 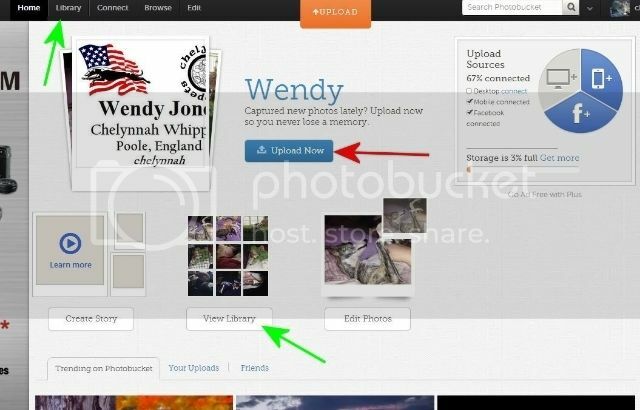 If the photo you want to save is on a website you will need to right click the photo and choose 'copy image URL'. Then paste (either right click and choose paste or hold down CTRL and press the V key) the link into the bar and click on Upload. 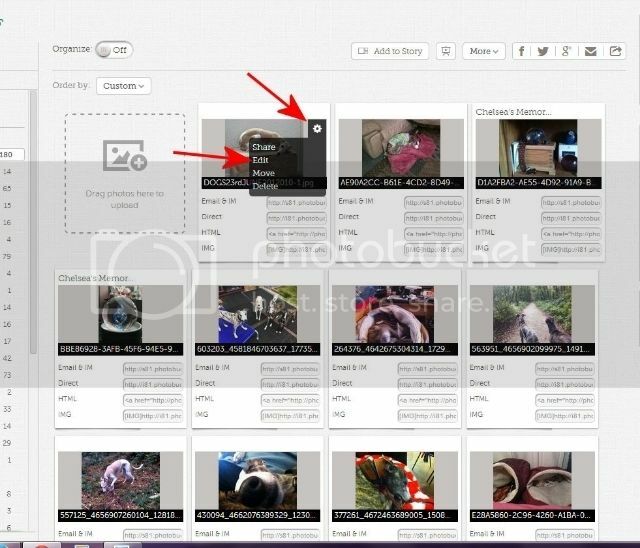 Photobucket has a LOT of fun editing functions that you can play with, but I am only going to discuss crop and resize as those are the most likely ones you will need. But of course feel free to have a play with some of the effects buttons etc. There are several roundabout ways to get to the editing functions, but the most straightforward way is to find the photo in the album you would like to edit. 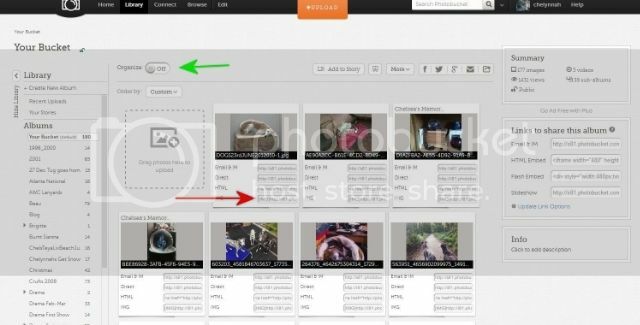 Hover your cursor over the photo till you see the 'gear' icon in the top right corner, click on the gear and choose 'edit' from the menu that drops down. Resizing. If you have already set up your upload options to 640 x 480 then when you click on Resize it will likely already have similar dimensions in the boxes. This doesn't mean the photo is already that size, it means that they are expecting you may want to resize it that way. As long as the largest number is 640 or less then all you have to do is choose 'Apply'. If you do make any changes make sure the padlock icon between the numbers shows as 'unlocked' (green arrow) or it will distort the photo. If it stays unlocked then all you need to do is change one number and it will automatically adjust the other number to keep the dimensions right. Choose Apply. Once you have made all the changes you want and have applied them, you will be back on the main edit page. To the right you will see 'Save' and underneath that a box that says 'replace original'. 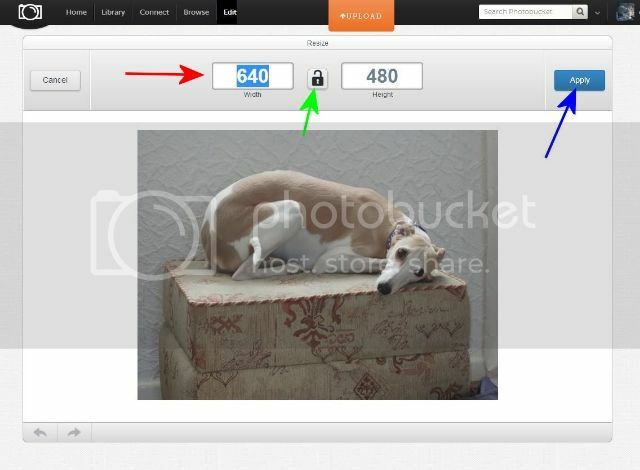 The idea of resizing (even though it links out at the right size) is to conserve your Photobucket storage space so you don't end up paying for them. So when I've resized and finished all my editing I check the box 'Replace Original' (under Save) and then save it. This also preserves the image title if you have already linked it to a forum so it doesn't disappear. Obviously make sure you have kept an original copy on your computer if you are replacing the file with an edited one. Go into the Album your photo is in. At the top of the Album you will see 'Organise'. For this step leave that button Off. The photos should all show in boxes, with all the link options below them. You are looking for the IMG code which is the code in the bottom box. The other way to get a single photo's IMG code is if you are in the full size view of that photo - the IMG code is in a box to the right of the photo. On this page you only have to click the code and you will see a quick flash of the word 'copied' in yellow highlight. This automatically copies the code. To choose multiple photos at the same time, go into your Library view and turn the Organizer button to ON (Red Arrow). This will turn all the photos to thumbnails without the extra information on each one. 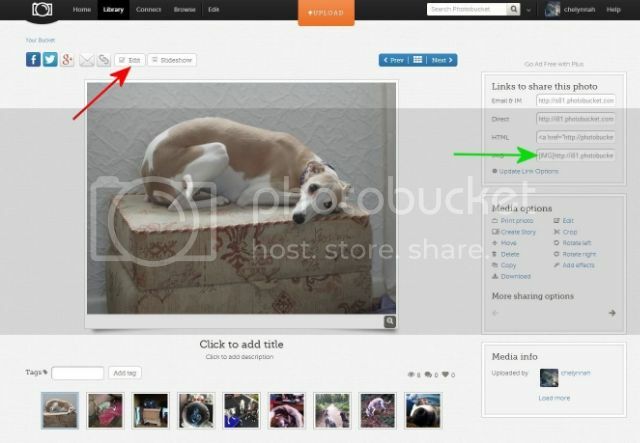 Choose the photos you want to put in your post (Yellow Arrows), then choose the 'Link' option at the bottom of the page (Green Arrow). A popup will appear with the codes you need. NOTE: If at any time the yellow highlighted 'copied' doesn't show in the situations I've described above, just left click once or twice until the code is highlighted in blue, then right click and choose copy. Sometimes Photobucket will hang and not act as expected. If there is anything I've missed, or anything else you would like to know please don't hesitate to post and ask. Once you have sorted your initial settings and have done it once or twice it is pretty straightforward. 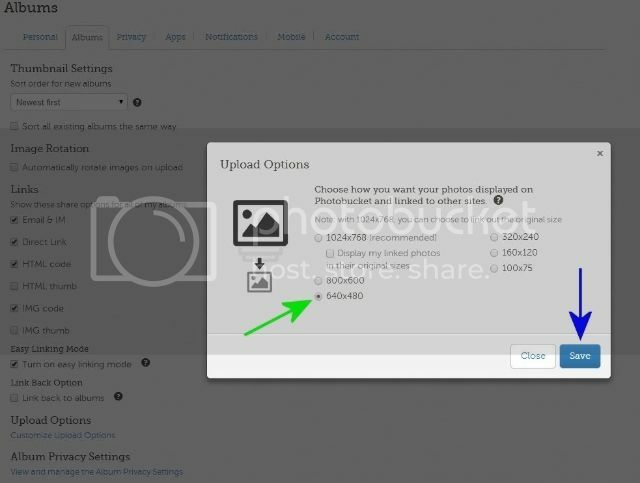 And as I said earlier you don't 'need' to actually resize your photos if you have the 'upload options' set to 640 x 480, but it is better for your storage space there if you do, or Photobucket stores them at their original size. I'm very confused. We are not to use Photobucket are we? Certainly, I hope the answer is no. If we have to create some account somewhere to include (VERY SMALL) photos of a 100KB or less size, that would be unfortunate. stf wrote: I'm very confused. We are not to use Photobucket are we? Certainly, I hope the answer is no. If we have to create some account somewhere to include (VERY SMALL) photos of a 100KB or less size, that would be unfortunate. OK, thank you. I guess there was no easy way to pull those images back to this forum? My wife and I have enjoyed just looking at the photos on the landing page.